And while I'm at it, you must watch "Bellamy's people"
Cheers Nick for finding this little mine of comedy gold. On the eve of the 1983 election – which, until this year, seemed destined to represent for ever the low watermark of Labour performances – a young member of the party's shadow cabinet delivered what was to be one of his most compelling speeches. Neil Kinnock knew a landslide defeat was imminent so, speaking in Bridgend, he sketched the world to come. "I warn you," he began, addressing a nation about to descend into the bitterest stretch of the Thatcher era. "I warn you not to be ordinary. I warn you not to be young. I warn you not to fall ill. I warn you not to get old." It was a rhetorical masterpiece from a man whose oratory would later be much mocked. But its power was its prescience. Kinnock saw the Thatcherite tsunami that was coming and warned of the deluge that would follow. This time even the most pessimistic Labourite cannot feel the certainty Kinnock had then: all kinds of permutation are still possible. But if the Labour vote crashes close to, or even below, 1983 levels, then David Cameron in Downing Street is the most likely outcome, whether governing as a minority, in alliance with the Lib Dems, or with a narrow majority of his own. What would he do if he gets there? What cautionary message might a 2010 Kinnock issue? For those still weighing their vote, here are a few salutary thoughts. I warn you that a chance some have waited for all their adult lives will slip away, perhaps taking another generation to come around again: the chance to reform our rotten, broken electoral system. If Cameron wins, he will not only thwart any move to fairer voting, he will act fast to rig the system in his favour. Even neutrals agree that his plan to cut the number of MPs by 10% – presented as a mere cost-cutting measure – will be one of the grossest acts of gerrymandering in British political history. Cameron will redraw the boundaries so that his rivals lose seats and he gains them, locking in a semi-permanent Conservative majority. Reform of our absurd, unelected second chamber will be postponed indefinitely, enabling Cameron to pack the Lords with his mates and sugar daddies, including perhaps a few more of those businessmen who so obligingly sided with the Conservatives in condemning Labour's plans for national insurance. If, on the other hand, Cameron is kept from Downing Street courtesy of a Labour vote tomorrow strong enough to make a Lib-Lab coalition plausible, then there's a clear chance for the 55%-plus majority who regularly vote for liberal or left parties to prevail and reform the system – ensuring that, from now on, the Conservatives hold power only as often as their minority status suggests they should. (They were always a minority party, even in the Thatcher heyday.) In other words, the victor tomorrow will get to set the rules for decades to come. This is a winner-takes-all election and the stakes could not be higher. I have tremendous respect for Kevin Hancock, who has undertaken a marathon task in aid of the RNLI, in memory of his best mate's son, who died in a tragic boating accident. I am doing this trip in memory of Lee Wood who was sadly taken from us on 25th april 2004 in a boating accident in which the RNLI searched in vain for lee but he was missing for a further 16 days and recovered on may 11th from the sea by the RNLI. His father Steven Wood, a friend of mine since childhood is eternally grateful to the RNLI for their efforts to find lee and is now constantly raising monies for the RNLI in various ways . I will be 40 on may 11th this year and was looking for something crazy to do- a plan was then hatched! The trip will be with me riding a 17yr old c90 honda scooter and leaving mumbles,swansea RNLI station on may 1st at 2pm. I will then ride around the coast of britain in an anti-clockwise direction visiting every station on mainland uk, i will be doing this in 15 days and arrive back in mumbles on the 16th may. The approximate mileage is about 4000 and the bike averages 40mph,whilst looking for 172 staions to visit, it will be a challenge i'm willing to take!!! some links in memory of lee. RNLI volunteers from The Mumbles will this weekend be bidding farewell to Kevin Hancock, as he sets off on a challenging 4,000 mile journey around the UK coast to help fund a new lifeboat. Kevin is making the final checks to his 90cc Honda, which will take him around 174 of the RNLI’s lifeboat stations during the 15 day trip, travelling at less then 40mph. Kevin is undertaking the challenge as part of his 40th Birthday celebrations and hopes to raise £1,000 towards a new Tamar class lifeboat for The Mumbles. He is dedicating the trip to 17-year-old Lee Wood, who died in a boating accident in 2004. 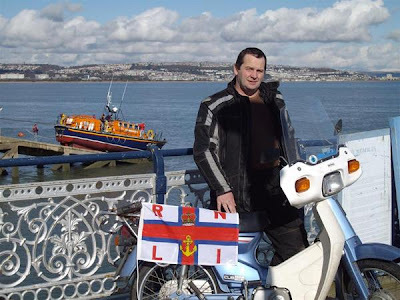 Lee's body was recovered by the RNLI 16 days after the accident on the 11 May – Kevin’s Birthday. Kevin is a lifelong friend of Lee’s father Steve Wood, who launched the 'Money for Mumbles' appeal in 2009. The fundraising drive, which currently stands at £67,000 aims to raise £150,000 towards the £2.7 million Tamar class lifeboat for The Mumbles. The intrepid fundraiser met with RNLI volunteers at The Mumbles last week which has strengthened his determination to raise as much money as possible. Kevin, who sets off from The Mumbles on Saturday (1 May) will be travelling the UK anti-clockwise and is hoping to collect more donations along the way.